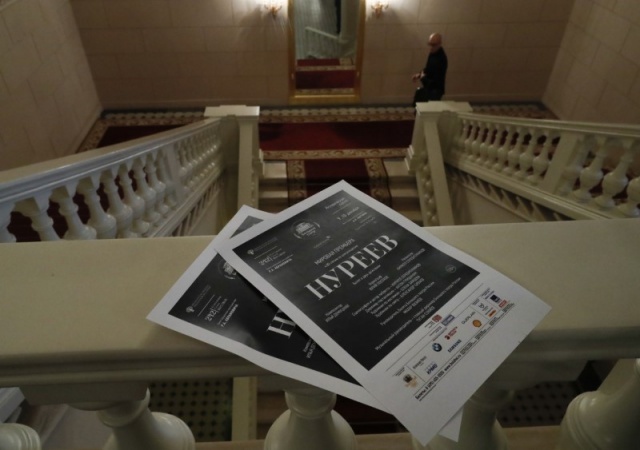 Among the award winners at the Prix Benois ceremony in Moscow was the ballet’s original choreographer Kirill Serebrennikov, who is awaiting trial on what his supporters say are charges trumped up to punish him for challenging the Russian establishment. The Nureyev ballet – which was completed by a stand-in choreographer because Serebrennikov was under house arrest – won in the best male dancer, best composer, and best choreographer categories, in addition to Serebrennikov’s gong for best production design. Serebrennikov was not present at the ceremony, at Moscow’s Bolshoi Theatre. The ballet’s composer, Ilya Demutsky, accepted the statuette on his behalf. “My feelings are that this is, in a way, a triumph, but at the same time there’s a certain bitter taste because we cannot share this triumph with our friend,” Demutsky told Reuters, referring to Serebrennikov. Nureyev, who died in 1993 from AIDS, was regarded as one of ballet’s most gifted male dancers and was an accomplished choreographer. The ballet about Nureyev’s life had been due to open at the Bolshoi Theatre in July last year but was canceled at the last minute, with the theatre’s management saying it was not ready. At the time, Russian state news agency TASS quoted a source close to the culture ministry saying there were concerns about the ballet’s theme of homosexuality. The ballet finally had its premiere in December last year, but the producers at the Bolshoi ballet gave it an 18+ rating. In one scene, dancers playing Nureyev and his lover, Danish dancer Erik Bruhn, performed a sensuous dance. At another point, a huge image of a completely naked Nureyev was briefly projected above the stage. That kind of portrayal was divisive in Russia, a country which adopted a 2013 law outlawing the spreading of “propaganda for non-traditional sexual relations” to minors. Serebrennikov was detained last August on charges of embezzling state funds provided to pay for a theater production, an allegation he has denied. Some of his supporters have said he is being victimized because his liberal views have irked social conservatives who have acquired influence in Russian state institutions. The Kremlin has denied that Serebrennikov‘s prosecution is politically-motivated. Other winners of the Prix Benois awards were Brazil’s Deborah Colker, joint winner of the choreography prize, Isaac Hernandez of the English National Ballet, joint best male dancer, and Sae Eun Park of the Opera National de Paris, who was best female dancer.